Was there a super-advanced culture in prehistory? If not, how can it be that the supposedly unsophisticated people of Stone Age Britain possessed a fully-integrated system of measurement based on a deep understanding of the solar system? 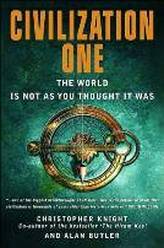 Civilization One, by Alan Butler and Christopher Knight. In Appendix III, entitled The Minoan Civilization of Crete, we present a few passages from the book The Knights Templar Revealed, by Alan Butler and Stephen Dafoe. The passages deal with the so-called "Megalithic Yard," a measurement that ancient Western adepts frequently employed when laying out and constructing innumerable sacred sites (stone circles, dolmens, cairns, tumuli, and so on) throughout Britain and Europe. The first man to rediscover this important measurement was the Scottish engineer Professor Alexander Thom. 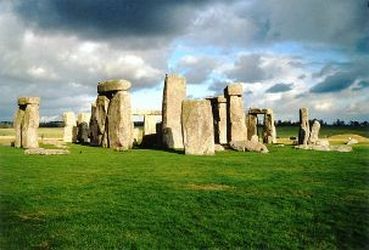 In 1955, he recorded his discoveries in his books Stonehenge; Stonehenge as a Possible Lunar Observatory; and A Statistical Examination of Megalithic Sites in Britain. Thom's hard scientific discoveries confirm the researches of Anna Wilkes, Comyns Beaumont and Conor MacDari, confirming the West to East migration of the elements of civilization. Since Professor Thom's time the investigators Alan Butler and Stephen Dafoe have discovered additional information about the widespread application of the Megalithic Yard. Crucially, they have also discovered that its origins were in the far West. Their seminal discoveries serve to strengthen our own theories concerning the West to East movement of the elements of civilization which unfortunately these authors do not consider or address in their otherwise fine works. 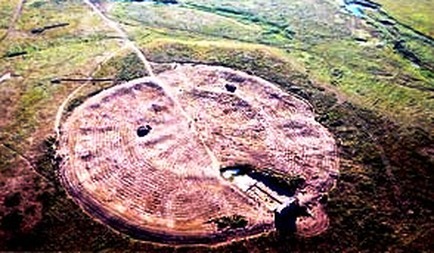 Generations of investigators have assumed that stone circles and other prehistoric monuments were built for some unknown pagan ritualistic purposes by otherwise unsophisticated Stone Age tribes...The evidence of Thom's Megalithic Yard has demolished any notion of the naivety of its creators assumed by most archaeologists. We have to respect these forgotten people for the great astronomers and geometricians they certainly were. It seems that there must have been a Civilization One; an advanced people who trained the rest of the world in science and technology, thereby leading it out of the Stone Age. The builders of the Stone Age monuments of the British Isles used a unit of length that was defined to one ten-thousandth of a millimeter. That unit is fundamental to the Sun, Moon, and Earth. Dr Michael Rappenglueck of the University of Munich has shown how a 16,000-year-old drawing of a horse in the caves of Lascaux in France is actually a carefully recorded Lunar calendar. ...Alan's previous research had led him to believe that the Megalithic Yard was, and is, a "geodetic" unit. This means that it was derived from the geometry of the Earth itself - specifically, it was based on the polar circumference of the planet. After studying evidence from the Minoan culture that had developed on the Mediterranean island of Crete some 4,300 years ago, Alan had concluded that the Minoan astronomer-priests had regarded a circle as having 366 degrees rather than 360 degrees that we use today. The evidence also suggested that the Megalithic culture of Britain had done the same...there are 366 rotations of the Earth in a year. A sidereal day is the time it takes for one revolution of the planet, measured by observing a star returning to the same point in the heavens on two consecutive nights...This sidereal day, or rotation period, is 236 seconds shorter than a mean solar day, and over the year these lost seconds add up to exactly one extra day, giving a year of just over 366 sidereal days...In short, anyone who gauged the turning of the Earth by watching the stars would know full well that the planet turns a little over 366 times in a year...If they considered each complete turn of the Earth to be one degree of the great circle of heaven...they would also logically accept that there are 366 degrees in a circle. There is no evidence that we are aware of that gives a precise measure for the gaz but we know it was very close to the Megalithic Yard, which was still in use in Britain when the earliest Indus Valley cities were established. 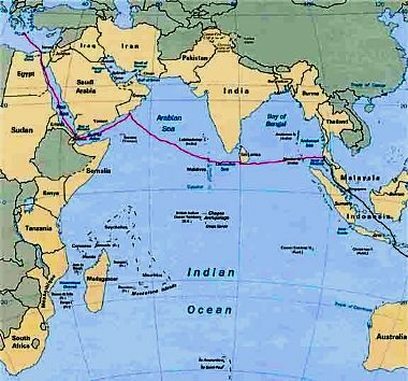 Could international communications have been so advanced as to allow a southern Asian culture to take its measurement system from the Megalithic builders of the western fringes of Europe? Or is it more likely that all the ancient cultures we have looked at had the same teachers? Could an otherwise unknown group of super-scientists, that we have dubbed 'Civilization One' have trained indigenous peoples around the world to accelerate global civilization. We found that the Megalithic numbers produced circles that combined the mathematical ratios known as pi and phi. Both are irrational numbers yet they produced results that are so close to being perfect as to be negligible. In our investigation we found that an American PhD student had discovered the existence of phi in Thom's data back in the early 1970s - a fact confirmed by the great man himself when he described the finding as "magical." We looked at the circumference of the Moon and found that it conforms to Megalithic geometry with precisely 100 Megalithic Yards to a lunar second of arc. Then we found that the Sun also conforms to Megalithic geometry with 40,000 Megalithic Yards to a second of arc. Vocalizing thee ideas would be highly dangerous for any academic who values his career and peer-group esteem. In academia, only the world of quantum physics has learned that reality is far, far stranger than any science fiction could ever imagine. We highly recommend the books The Knights Templar Revealed, by Alan Butler and Stephen Dafoe, and Civilization One, by Alan Butler and Christopher Knight, particularly because of the information concerning Professor Alexander Thom and the Megalithic Yard. We believe that the amazing discoveries made by these authors are but a small example of the mathematical and geometric expertise possessed by our ancient forebears, particularly those of the Western hemisphere. As the years go by we know that more discoveries concerning the technical and spiritual advancement of prediluvian man will be made. 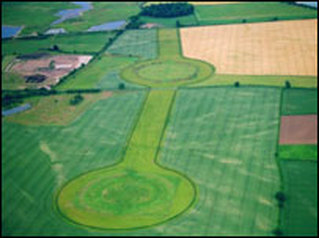 Above we see Thornborough Henges in Yorkshire England. Over 5,500 years old, the site predates the Egyptian Pyramids. 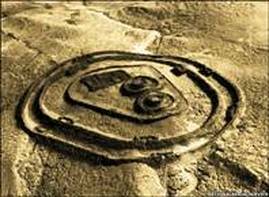 The entire area was sacred to the ancient Megalithic People, and the henges are perfectly astronomically aligned. Newgrange (Gaelic "Bru na Boinne") is one of the oldest megalithic structures in the world, predating the Egyptian pyramids. The tumulus stands with two similar cairns in Country Meath Ireland. Perfectly aligned to the Winter Solstice, it is built without cement in a manner never duplicated or understood. It stands near to the Boyne River, named after the goddess Boann. Newgrange is connected with several major Irish heroes, particularly Midir and Aengus. In modern times the many massive base stones were deliberately turned face inwards to obscure their highly detailed astronomical inscriptions and etchings. The famous triskellion of three spirals exists within the center of the cairn. Within the structure is a small room into which, on the three days of the Winter Solstice, a thin beam of sunlight penetrates for 17 seconds. The light falls within a few inches of the symbol of the three spirals. These spirals may represent the pregnancy period of nine months. 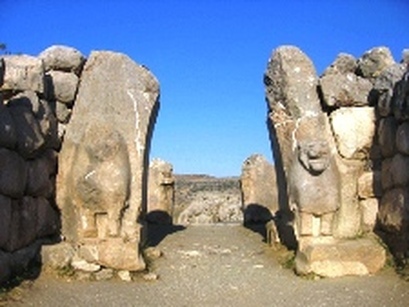 The megalith itself thereby representing the womb of the earth mother Eri or Danu. This anomaly is a analogy of the spiritual light (wisdom) entering into the purified mind of man. The inner chamber of the cairn is cross-shaped. The cross was worshiped throughout the world long before the advent of Judeo-Christianity. Modern engineers are baffled as to Newgrange's construction and are unable to emulate its modeling. Astronomers are perplexed as to how beams of sunlight and moonlight still precisely enter through the tiny portal above the main entrance after 5,000 years. The true "Stone of Bethel" ("stone of the house of god"), mentioned in the Old Testament, stands in front of the cairn's main entrance. It was this mysterious Megalithic Race (the Arya or Elders), the ancestors of the Gaels and Celts, who were responsible for Newgrange, the nearby twin sites of Knowth and Dowth, the Stonehenge complex, Avebury, Carnac, and the thousands of other cyclopean chambers, cairns, mounds, monuments, tumuli, and ley lines which network Europe and the world. The massive Avebury Serpent Mound of 2000 BC. This ancient earthwork should leave one in no doubt as to the identity of the builders of the great Ohio Serpent Mound in America. The "Mound Builders," like the Anasazi, were Irish. Irish artifacts and jewelry have repeatedly been discovered within these chambers and earthworks. Scholars such as Augustus Le Plongeon and Barry Fell, who established the "Celtic" presence in the Americas, have had their works suppressed. Nevertheless, Stonehenge, Newgrange, Avebury, Carnac, and the Glastonbury Tor and Zodiac, are but a few of hundreds if not thousands of cyclopean marvels throughout Britain. Archeologists have found a carved python as tall as a man and 20 feet long inside a cave in the remote hills of the Kalahari Desert of Botswana, and they say it is proof that humans were performing rituals 70,000 years ago. Prior to the recent discovery scientists had thought human intelligence had not evolved the capacity to perform group rituals until perhaps 40,000 years ago. The Step Pyramid of King Djoser at the Necropolis of Saqqara: is one of the oldest burial sites in the world, featuring the oldest step-pyramid in the world, and one of the oldest pyramidical structures anywhere. The Saqqara ruins can be traced back to the time of the First Dynasty, over 5,000 years ago. Including Djoser's pyramid, there are another 16 pyramids in the necropolis, and there are numerous other mastabas (underground burial chambers) on the site. The name Saqqara or Sakkara comes from Saca, which referred to Indo-Europeans. It primarily referred to the Scythians, but may have referred to even more ancient Irish settlers of Egypt. The term Saca is also the origin of the word Saxon. It referred not to "bow men" but to "Stag Men," that is, to worshipers of the Stag God Herne, similar to the Egyptian Thoth and Greek Hermes. In Egyptian the word for stag was ayir, which connotes the "Arya," or wise-ones. The symbol of the stag, like that of the lion and unicorn, can still be seen on royal heraldry. Certainly, the stag has been depicted on the most ancient wall art, and mentioned in the earliest Bardic poetry, like that of Amergin who described himself as a "stag of seven horns." The stag god of Britain, France and Scandinavia was often rendered Hu Gadam, Cernunnos, and also as Herne. The Grecian Hermes was derived from this earlier god. Clearly the lord of stags was connected to everlasting cycles, underworld traversals, fertility, physical skill and shamanic power. In Norse mythology four stags were believed to live in the great tree of life known as Yggdrasil. Indeed the word deer is not a million miles away from der which (like dar and dru) connotes the Druids. 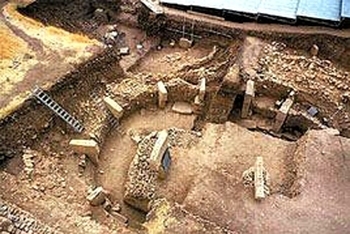 The ruins of a massive pyramid found in Lugansk, Ukraine. The name Lugansk probably derives from the Irish sun god Lugh. Indeed, experts believe the pyramid to have been dedicated to the sun god. Interestingly, the Ukrainian pyramid dates to over 5,000 years and it predates the Egyptian pyramid by over 300 years. Bosnian Pyramids: A massive pyramid was discovered in Bosnia at Visocica Hill, near the town of Visoko, northwest of Sarajevo. It is one of five large structures in the area and has been named the "pyramid of the sun." The area with the five massive Bosnian pyramids is honeycombed with underground tunnels. 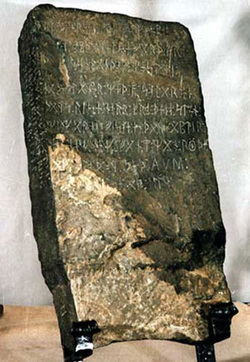 In one of the passages marking were discovered which are identical to Nordic Runes. Does this mean that Scandinavians were in Eastern Europe? And where they somehow connected to the construction of these pyramids? If they were not then how did these markings come to be there? 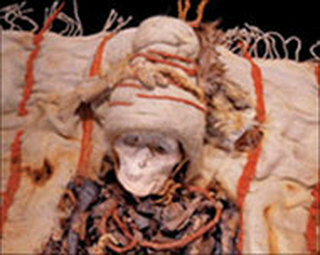 Caucasian (White) mummies found in China's Tarim Basin region of modern China. They date from 3,800 years ago. Pliny, the Roman historian, referred to them as Seres a word meaning "Westerner," and also "Seer" or "Wise Ones." This word is the same as Syria (the land of the "Westerners"), and Sera, the word the Egyptians used for King or "Pharaoh." The female name Sarah, from Sarai, meaning "Princess" is also etymologically related. The Tocharians. For generations, the idea of Caucasian settlements in the Far East was dismissed as impossible, until the discovery of tribal peoples known as "Pazyryk" and "Tocharians." Mummies of the so-called "Tocharian" People date from 1800 BC. These were blue-eyed "Indo-Europeans" (or Indo Aryans) who lived in the Tarim Basin of China. These races inhabited the Far East 1800 years before Christ. As Indian history had always maintained, Indo-European People had lived and ruled in ancient Bactria, the Hindu Kush, and Indus Valley region of Pakistan. Remains of these people have been found in Tajikistan. These races wore tartan and the women wore skirts almost identical to those worn in northwest Europe during the Nordic Bronze Age. Individuals have been exhumed with red and blonde braided hair. According to the Mahabharata the Tocharians may have even given China its name. The "China" was a term that was used to describe the Caucasian Tocharians. (China's original name was Cathay). No doubt a great deal more information regarding the Indo-European occupation of the Far East would be forthcoming if it had not been for generations long cover-ups. One of the largest pyramids ever discovered outside Egypt is located in Mongolia (Northern China). This giant structure is thought to be over 5,000 years old. Suggestively, it stands in a province by the name of Aohan, which is a patently Gaelic word. In our estimation, most other pyramidical structures throughout the world (both those known and those to be discovered) will be based on Irish-Druidic knowledge which derived from the Prediluvian civilizations. Perforated Skulls of China: The modern technology of craniotomy, a surgical operation performed on the brain through an incision in the skull, may have been in use in China nearly 3,000 years ago. Scientists made the conclusion after a detailed study of 13 perforated skulls unearthed in the northwestern region of Xinjiang. The skulls were found in a cluster of more than 2,000 ancient tombs in the desert outside Turpan, 200 kilometers east of the regional capital Urumqi, said Lu Enguo, a researcher with the Xinjiang Institute of Archeology. 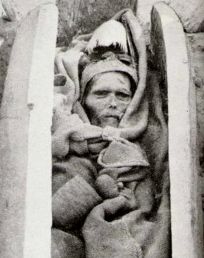 Lu and his colleagues also found 600 mummies in the tombs, a dozen of which are believed to have been shamans because sacks of marijuana leaves were found next to the corpses. The best preserved mummy is a Caucasian male and about 1.2 meters long...The mummy was dressed in a leather coat, a knitted cloak, hat and boots. He wore earrings and a necklace, and held a copper laced staff in one hand and a bronze axe in the other. Three ancient harp-like string instruments were also discovered, which archaeologists believe were used by the shamans to communicate with the gods. The Chachapoyas were a tall, fair-haired, light-skinned race that some researchers believe may have come from Europe...Little is known about them except that they were one of the more advanced ancient civilizations in the area. Adept at fighting, they commanded a large kingdom from the year 800 to 1500 that stretched across the Andes. Pedra da Gavea in Rio de Janeiro Brazil. 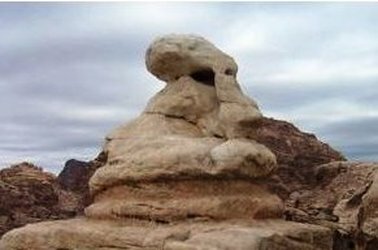 The rock has been sculpted to resemble a sphinx-like human face, and the strange mountain top site and its carvings is thought to be of Phoenician origins. 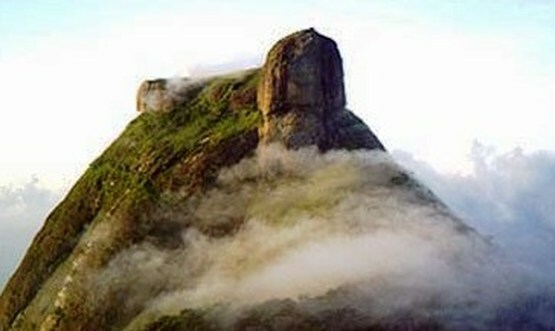 It is but one of several enigmatic sites in Brazil and South America of "unknown" origins. The builders of da Gavea are speculated to be the same people who constructed the famous Nazca lines in Peru. Two Phoenician youths from the city of Sidon. Their features are noticeably Caucasian. Satellite imagery reveals ancient ruins in Syria ("Land of the Westerners"). In 2005 archaeologists discovered the remnants of intense warfare which took place in Syria approximately 3500 BC. Cities have been discovered in Syria dating back to over 5, 500 years. Aridity has left Syria looking much different than it did in ancient times. Like the Lebanon Syria was lush with forests. The Phoenicians coveted the trees of Syria and used the wood of Syrian cedars, pines, and cypresses for ship building and city construction, etc. The vast stone circle at Arakaim in Russia. Built by the ancient Megalithic People, known as the Kurgan, from whom the "Celts" are believed to have originated. St. Paul's Cathedral. This prominent and well visited Christian building stands upon Ludgate Hill where a large temple and shrine to the Gaelic sun god Lugh (Anglo-Saxon Ludd, Welsh Llew, Latin Lugos) existed in ancient times. Most prominent churches, stately homes, academic institutions, and government buildings have been deliberately geomantically constructed upon such Druidic sites of power to both benefit from their natural power and to obscure their existence. The name Romans then named the location Londinium from which we derive London. The Latin word Logos, meaning reason, intelligence, truth, or word, comes from this sun god's name. The Irish Lugh was known as Ildanach, the "Master of all the Arts." Several other place names bear the root of his name, for example, Leinster, Lyon, Leyden, and Laon. Lugh was known to the Gaels as the "Lion." He is clearly the prototype for the Indian Yudhisthira (the “Left-Handed Archer”) and for the Biblical kings Saul and David. Nearby to St. Paul's Cathedral is Ludd's Gate. The Thames River, Temple Bar (of the Templars), Fleet Street (the newspaper district), and the law courts, are not far from this sacred site. Francis Crick and his team worked on the DNA helix practically in the shadow of the Cathedral at Temple Bar which was once called Temple Church owned by the tax-exempt Knights Templar who also provided most of the liquor to London's many inns and taverns (known as "Arms"). When the kings and queens, of England's royal families, annually come into the district before the Lord Mayor of London they are handed the Sword of State. This, like most royal pageants and rites are rituals with roots in the Druidic tradition. The old word for Mayor, was Alderman, named after the Alder Tree sacred to the Druids sun priests. To this day Temple Bar is "guarded" by two winged dragons upon phallic pillars. Sculptures of this sort, especially of dragons, mark strong vortexes of earth (geomantic) energies known as Ley lines or Synchronic Lines. Most British cities are built on or near major Druidic locations, and many have Druidic names (for instance, Edinburgh, Carlisle, Belfast, Dublin, Silbury, Colchester, Dorchester, Oxford, etc.). The name Paul can be rendered Apol from Apollo, Greek god of the sun (version of Lugh). From apol we get pole - the axis of the earth, or also apple - from apolon or avalon, the Celt's mythic "Isle of the Apple Trees." The tale of Avalon, picked up by the Greeks from the Irish, became the "Garden of Hesperides" in the Hercules story. Hercules was based on the Irish god of strength Ogma. Round Towers are a specifically Irish phenomenon. Known as "Bell Houses," towers of this kind have been found scattered parts of the world, with many destroyed to obscure their Irish origins. Those in India are not of Indian construction. LEFT: Herne or Cernunnos was an early Irish god venerated throughout Britain, France and Europe, until almost every site dedicated to him was obliterated by Christians. He was also known as Nikor. He was the original "horned one." He was the original wearer of the Crown of Thorns (antlers). RIGHT: Pashupati or Shiva, "Lord of the Beasts," one of the oldest gods of India. The Irish traveled to India and were known there as the Arya or "Noble Ones." Evidence of the Irish influence in eastern climes (Egypt, China, and India) has been deliberately suppressed. However, satellite photography reveals settlements that once existed along the banks of great rivers such as the Saraswati. These were densely populated by white Western emigres, received by locals not as ruthless barbaric "invaders," but spiritually and technically advanced brethren. From this stock came some of India's greatest monarchs, such as Rama and Ranjit. In India, most educated and unbiased people openly speak of the coming of the Arya from the West. Several native groups in India, such as the Sikhs (or Jats), purport themselves to be the descendants of Western settlers. Note that the Western image of Herne did not derive from the eastern image of Pashupati. It was the other way around. Therein lies the true history of races and tribes. Note that beside Herne is a stag, the Druidic symbol of divinity and royalty. The serpent is the symbol of secret wisdom and spiritual attainment. Before the Ankh, it represented immortality. Herne was also known as Hu Gudam by the Irish Druids, and also as Cernunnos. He was connected to fertility, forests and nature, and also to the Underworld Cycle. Cernunnos was a prototype for Hermes (Mercury), Orpheus, the Green Man (Arabic El Khidr, a name for John the Baptist), for Nicor (corrupted to"Old Nick"), and for the Egyptian Sokar. We certainly agree with author Maurice Cotterell who has independently discovered, via his exemplary symbolic and astrological analysis of the famous Gunderstrup Cauldron, that Cernunnos was the prototype for Jesus Christ. Note Herne's "crown of thorns." There is a good reason why the image of Herne bears an uncanny similarity to the Templar icon Baphomet. The icon Baphomet is a version of this more ancient Irish god. The Masons, Templars, Rosicrucians, and other secret fraternities, as well as the Roman Church, are Atonist enclaves responsible for the plagiarization and acquisition of Druidic religious elements. Since the Templars did not wish it commonly known that they were the keepers of Druidic lore, the image of Herne was cleverly adapted and modified to conceal its true origins from the curious. Many of the great Templar-Merovingian elite were educated in Ireland by Culdean monks, those whose job it was to collate the knowledge appropriated from the Druids who both preceded and excelled them. These Culdeans were part of the so-called Celtic Church that eventually came into conflict with the hardline Papal Church of Rome. The conflict between these two factions of Christianity is explained in Volume One, in our chapter entitled The Occult History of Christianity. As said, Herne was the prototype for the Grecian Herme or Hermes - keeper of wisdom and messenger of the gods. Hermes became the Roman Mercury, one of the most important gods whose symbolism can be found in every sphere of life. In the orient Herne is closest to the Dravidian Shiva and the Egyptian Set. The word Set derives from a word meaning "Stag," and the horns of Herne were those of the stag which was, along with the serpent, a sacred animal to the Druids. It was from the dawn of time considered a symbol of divinity and royalty. It is mentioned in the earliest Bardic poems, such as that of Amergin. The strange "Serpent Mound" discovered near the city of Petra. This mysterious city in Jordan, approximately 80 km from the Dead Sea, known locally as Rekem, was supposed to have been home to the so-called Nabateans. This group was, however, a latecomer to the region, arriving around 500 BC. The mountain were Petra stands is called Mt. Seir (meaning "head" or "sun"). How the precincts, temples, altars, grottos, graves and halls were carved from solid sandstone remains a mystery. The inhabitants of the city clearly dominated the many crucial trade routes which passed through the region. Petra has provided shelter and refuge to various squatting "Semitic" tribes over the centuries, and there are many theories as to the identity of its originators. 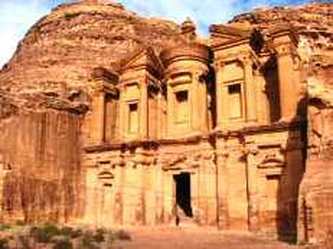 Interestingly, one of the most spectacular buildings, the so-called "Monastery," is known in Arabic as El Deir, a word phonetically similar to Elder, and which contains the word Deir, signifying the Druid Elders of the West. Another term applying to the site was Shara (from the Temple of Dushares, or the "Pharaoh's Daughter"). This term Shara contains the root hara for "Horus," and also Ara from "Ayra." Ra (in Petra and Shara) was, of course, the sun god of ancient Egypt. Advanced systems of irrigation have been discovered showing that the architects were highly sophisticated. This means that they were Egyptian, Phoenician, or Irish. Megalithic structures in the area bear a likeness to those found in Britain and Ireland. Phoenicians cities in Egypt date from the remotest period, long before the rise of the first dynasties. Although Petra itself dates to a late period, it is built over a more ancient site attributed to a people known suggestively as "Horites." This clue leads us to believe Petra to have been created by the Shemsu Hor, or "Disciples of Horus." These Horites are purportedly the ancestors of the Edomites. Edomite means "red-skinned man." 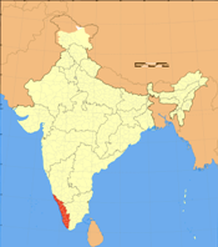 ﻿﻿LEFT: red marks the district of Kerala. RIGHT: Dolmens found in Southern India, at Kerala (a major area of Shiva worship.) These dolmens were erected by Neolithic tribesmen and are clearly modeled on the Irish version. Hyderabad in the Andhra Pradesh region of Southern India. Dolmens and stone circles of Druidic-Irish type are found in plenty. The "Brazilian Stonehenge." The discovery of an ancient astrological observatory in Brazil lends support to the theory that the Amazon rainforest was once home to advanced cultures and large sedentary populations of people. Besides the well-known empires of the Inca and their predecessors, millions of people once lived in the forests and shaped the environment to suit their own needs...The pre-colonial observatory was built of 127 blocks of granite each three meters (10 feet) high, arranged upright and evenly spaced in circles in an open field. The archaeologists do not know yet when the structure was built, but ceramic fragments found nearby suggest that it is between between 500 and 2,000 years old. 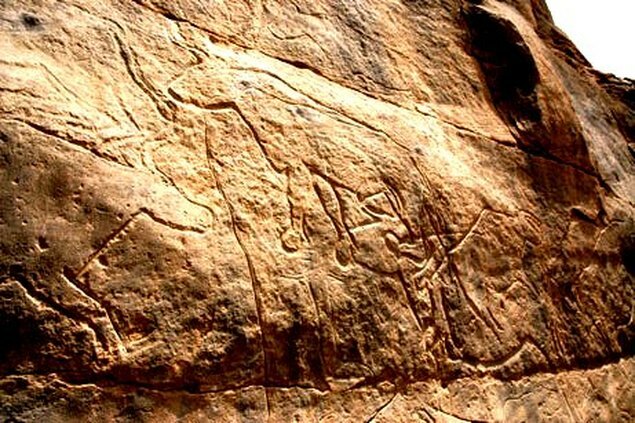 Rock face drawings and etchings recently rediscovered in southern Egypt are similar in age and style to the iconic Stone Age cave paintings in Lascaux, France, and Altamira, Spain, archaeologists say..."It is not at all an exaggeration to call it 'Lascaux on the Nile,'" said expedition leader Dirk Huyge, curator of the Egyptian Collection at the Royal Museums of Art and History in Brussels, Belgium..."
Turkey's Megaliths: Were they Native? Kamari Kandam, Indus Valley, Lost Land Bridges, Malta, etc.